The news that Persona 5's Joker is headed to Smash Bros. 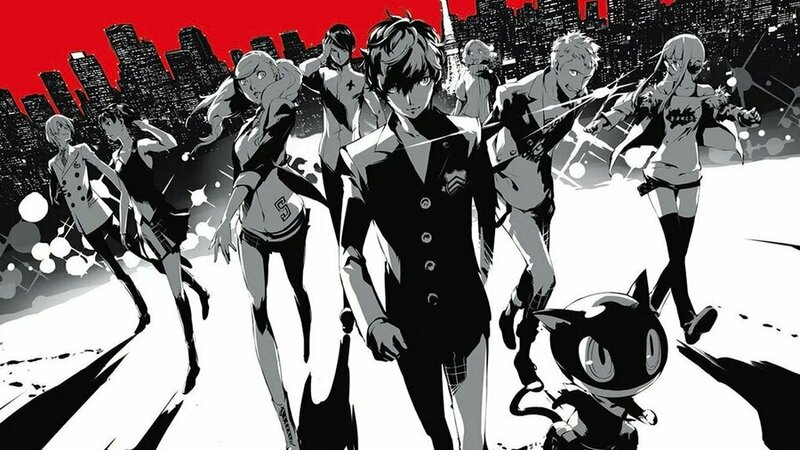 Ultimate as a DLC character has naturally sparked predictable chatter that Persona 5 itself is Switch-bound, but we've actually heard a rumour that appears to have some substance to it. The source is MysticDistance, a translator and secondary writer for Persona Central and several other fan sites. MysticDistance has stated that Persona 5 will hit Switch next year, and the announcement will take place the day Joker becomes available in Super Smash Bros. Ultimate. Rather than being a straight port, the Switch version will have a new title and will come with a raft of adjustments and additions, as well as new story elements. While we're not sure how reliable MysticDistance's source is, it is claimed that a Switch port has been under consideration since last year, and that the final title will be based on one of the domains recently registered by Atlus. This would suggest something related to P5U.jp or P5R.jp, two domains snapped up by the company that have yet to be assigned to anything. Nintendo Soup is reporting that Persona 5 Reloaded is the official title. Persona 5 sets the benchmark for modern Japanese RPGs: it oozes style, charisma, and polish quite unlike anything we've played. With this fifth entry, the series' trademark formula of dungeon delving and socialising has been perfected. Addictive, engaging gameplay, incredibly endearing characters, and a consistently rewarding narrative loop combine to create a spectacularly cohesive whole – whether or not you're already a fan of Persona. A masterpiece from top to bottom. What do you make of this particular rumour? With Joker coming to Smash it would make sense, but then again, we've got Simon and Richter Belmont in Smash and Konami hasn't announced a Castlevania title for Switch. Let us know your thoughts by posting a comment. @Equinox You mean how like for Cloud FF7 is coming to Switch next year and for Snake there's a game of him on 3DS? Or probably just because of Persona Q 2, not 5. I mean, I want 5, but Joker is in PQ2. Meh. I would prefer enhanced versions of SMT4 and SMT4 Apocalypse. They have more demons, more strategy and less dating sim and j-drama filler garbage. Doesn't Sony have an exclusivity deal for the mainline Persona games? @KayFiOS no they don't have exclusivity. The publisher has always just chosen to keep the persona series on Sony platforms. I really hope it does happen. P5 is an absolutely incredible game, and as many people should get the chance to play it as possible. Cloud's excuse was that he appeared in a Kingdom Hearts on the GBA, Snake's was the Metal Gear for Game Cube. I was kinda hoping for Persona 5 for Switch until @deKay pointed out Joker is in PQ2, that's probably it. Doubt it, BUT, it's on PS3 so it could run. No idea how that version runs though. Hopefully. The game looks amazing (and from what I've heard, so is the soundtrack) and I don't want to spend a lot of money on a PS3/4. Well, all persona games have had a big enhanced version on a handheld console. It was always on PSP/Vita, but with them pretty much out of the picture, it isn't unlikely that the Switch will take their place. @Kirgo Except for P3Port, which missed the whole "The Answer"
This game is incredible, and is my third favorite PS4 game. I really hope this comes to Switch so Nintendo fans can enjoy it. If there’s one AAA game I want to come to Nintendo Switch it’s Persona 5, so I’m aching for this to be true. Either way, having the leader of the Phantom Thieves in Smash is more than enough to get me to buy the DLC season pass! Someone correct me here but didn't Sony have some involvement with Persona 5 in a similar way that Nintendo did with Bayonetta 2? If so surely that would mean that a straight port is impossible. At least localize PQ2, pretty please? @dourfram "less dating sim and j-drama filler garbage." Persona isn't the game for you. Dating sim j-drama is what differentiates Persona from pretty much every other RPG out there. Why not play one of them instead of complaining that Persona isn't the same as them? @Kirgo My thoughts exactly. Persona 5 Portable - it had to happen, and the Vita's life support has already been turned off. I don't want to get my hopes but. But I would absolutely buy P5 on Switch day 1. Safe to say Master Chief, Ratchet or even Sly and Daxter will be appearing next as DLC characters. Don't even need appear on a Nintendo system at this rate. @Equinox well snake was in 3ds snake eater. That would be nice. Persona 5 is a great game and I would have loved to have had it portable on the Switch when I played it earlier this year. The thing is that mainline Persona has always been Sony I believe. Someone correct me if I'm wrong. but added an optional female protagonist which in turn changed a few other things. 15th of September 2019 would be 3 years gone. Maybe after that they can call it an ultimate edition and get away with dodging the exclusivity on PS4? And it seems a while since we heard anything about SMT5. Hope this rumor is true but you never know. Still atlus has always bin supportive with rpg before ,and while they were usually on nintendo's handheld I doubt they won't try to test the market. Loved P2, P3 and P4. The only reason I didn't get into P5 was because it was inexplicably made for PS4 and PS3, but not Vita (I mean, I get why, the Vita failed, but P4Golden was on it, and I can't imagine the sales for the PS3 version were any better than a Vita version would have been). I wanted to play P5 on a handheld like the others, so if they do port it to Switch I'll be very happy. But it seems unlikely. These rumours are all awesome! It’d be the dream. I’ve already played this on PS3 but this is the one title I’d buy again just to play portable. Truly a 10/10 game. Persona 4 Golden is the reason anyone bought a Vita, just saying. I have played this game multiple times since its release, and I would buy a portable version in a heartbeat. If Sony doesn't have money in the pot on it, Atlus has been a decent supporter of Nintendo, so this seems really possible. It'll probably be Persona 5 (insert title here), much like it was with Persona 4 Golden on the Vita. Since the Switch is killing the Playstation in Japan, I figured they were going to bring the series to the Switch eventually. The Vita version of Persona 4 was the top-selling game and a system seller, portability is king in Japan. @Equinox? Why would they need to keep both companies happy? Atlus and Sega are going to whatever they want to make money. If putting Persona 5 on the Switch prints money for the team, then they're going to do it. There is nothing in writing saying Persona is a PS exclusive, it's assumed since Sony and Nintendo have locked the country locked up. @readyletsgo as far as I know, the only difference between the PS3 and PS4 version is 720p vs 1080p and loading times. I don’t have a PS4 to compare myself but I had no issue on PS3 whatsoever. I haven't played it yet and have it on PS4 but I really hope this is true. Bringing the Persona series over to Switch would be massive. Currently playing P4 Golden on Vita (one of many games I'm juggling atm) and loving it. @EchoNemesis did it specifically only show P5? How can you tell it wasn't PQ2? @Dualmask You have to keep in mind that the portable versions all came way later than the console version and had always an upgrade in some way. It really wasn't a surprise that P5 would at least not get a handheld version immediately. I'm keeping my hopes in check, because this could be a case of Nintendo giving Sakurai enough wiggle room to pick what he wanted. But I wouldn't be surprised if we get SOMETHING from the Persona series next year. I just don't see why Nintendo would put Persona characters as an option for Sakurai otherwise. @Kirgo You're right, I did forget that. After not getting Metroid at the game awards, I won't be trusting insiders or speculation for a long while. I’m fine with having it on PS4, as much as I love it I probably won’t double dip for it. Something for people to look forward to for those who have a Switch though. If this turns out to be true anyways. @readyletsgo the PS3 version of P5 runs just as good as the PS4 version, it was built for the PS3 first. Remember that Nintendo chose the DLC characters, not Sakurai. Each character has and will meet a specific purpose. Of course this is attached to another game to be promoted. It may be either a P5 port, Shin Megami Tensei V already announced, or both! It's probably because of PQ2, it was released a few days ago in Japan for the 3DS. @Ooccoo_Jr no. Persona games have sold pretty well enough to not need assistance from Sony. However the publisher just choose to stay on Sony. The fact that the crossed a specific game rather than series like the did with the others makes me think the game is inbound. There was plenty of smt fodder on Nintendo systems that they didn’t have to get him and they did not cross with personaQ which would have made more since (as he is in Q2). So I guess I am glad I keep forgetting to buy it in PS4. I like how people are saying Snake's "excuse" was either the MGS remake on Gamecube or the MGS3 remake on 3DS, when the first Metal Gear game was on NES. @deKay if you're talking about the trailer, it said 'Smash Bros x Persona 5' quite clearly at the end. Hoping the rumors are true. But how long do we have to wait? @Equinox But....Switch is getting FF7/Cloud. That leaves only the Snake situation, but Nintendo consoles have hosted several MGS games, and of course, Nintendo was the first console to ever have Metal Gear, so Snake has a long history with Nintendo, having started there, even if it's no longer associated with Nintendo. Persona is weird. The only presence of Persona on Nintendo is the Q spinoffs on 3DS, and BazBlue Cross Tag. This really does make me think it's inbound. Plus it's a game designed for PS3, so it certainly is more than capable of running on Switch, and, let's face it, the Nintendo audience makes more sense for Persona games than the PS4 audience overall.....I really don't understand why Persona has been PS bound for so long to begin with, especially since Atlus recognizes the Nintendo audience potential by making SMT Nintendo exclusive. @Spectra P4 was very very well received. What didn't you like about it compared to the others? Persona 5 runs just fine on PS3. It is basically a PS3 game and was intended for PS3 for most of its development. A Switch version seems fairly likely. A port shouldn't be too hard. I'm not sure if Sony has exclusivity or timed exclusivity... True exclusivity is quite rare these days, especially if the platform holder didn't just outright buy the game from the developer (like Nintendo did with Bayonetta 2 and 3). I would be far more surprised if P5 was released for the switch. I don't see it happening but if it does then great. I say it is more to promote P2Q then anything else. Even though I love the game I can't see myself double dipping on the game if it is a straight port. If they make changes and add stuff like Persona 4 Golden then ya I will double dip on it. I'd assume Atlus is too busy developing SMT V for this to be true, but I certainly would be a buyer if it is true. Considering that this was a Nintendo choice and not a Sakurai choice it has a better chance than Snake or Cloud did with their titles. But when Snake was included in Brawl, Twin Snakes only came out a few years prior with the push of his creator Kojima to be included. As for Cloud, I feel that was Nintendo and Square Enix sending a message that future Final Fantasy titles post 6 were coming to a Nintendo console in the future. And, well look at 7, 9, 10, 10-2 and 12 are hitting the Switch in 2019. I think we should take this as a cautiously optimistic kind of rumor. I had it for PS4. It's pretty good but I had problems in the past that's related to P5 that I want to avoid it. This is exactly why I saifd No to Super Smash Bros. Ultimate. I had problems with the previous games that I don't want to go back to my past. That's why instead of getting new Switch games I decided to get Medabots for Christmas for my GameCube/Wii. @Leuke I don't care about Animal Crossing but I love playing as Villager and I'm looking forward to Isabelle. Same with like, half of the roster in Smash. Caring about/playing the game series doesn't have much impact on if they're fun to play as in the game, IMO. Great Game! But already played it. Announce 5 but also give the Switch the next one. Fans of big games like Persona do not wait 2 years to play it. @Agramonte Well, if we got a port of 5 and it did decently well. It stands to reason the next one would naturally follow, barring a lucrative exclusivity deal from Sony. @Spectra Interesting. I do disagree with a lot of it, but it overall does reinforce just how niche Persona is overall. I'm mostly just surprised you do like 5 considering how much you dislike 4. They're not really all that dissimilar. In 4 specifically I'll say though that the characters i thought were one of it's strongest points, however, yes, they were one dimensional. It had a purpose though, the theme of the game was the polar nature of one's public self and private self and the way the private self kind of festers in darkness (and shining a spotlight on that.) Thus to pull of the contrasts in those natures, the characters had to be one dimensional to represent each extreme. I think it worked well for what they were trying to represent, though maybe in a sense it didn't develop the most interesting characters. The theme in 5 is really about the dark side, of the publicly polite Japanese culture overall, so it's a lot less character centric in the theme setup since the world, or total cast, is the object of the dichotomy not each individual character. But, yeah, it's still Persona, I'm definitely surprised someone that dislikes 4 so thoroughly would like 5! It says a lot they were able to change it up enough to appeal to someone that otherwise doesn't click with their designs. @Regpuppy P5 on Switch - should not even matter. Persona fans always needed a playstation to play it. And the PS4 is still selling like hotcakes now (with P5 at $25). All they will get on Switch are stragglers. Getting the new game in a series on Switch should not depend on how many people in the fan base want to re-play an older version. But does it matter? Yes, quite often. Big Publishers are always skittish about bringing an ip over to a different platform. Not to mention, the noise people make online points to there being at least some demand for P5 on Switch, and a digital version costs them relatively little to do. So even if it is "just the stragglers" it might be a worthwhile test on the Switch as a platform. As the Switch userbase grows, there's a stronger likelyhood they can reach people who don't own a PS4. @Regpuppy Atlus has a better footing than most companies when gauging platform interest for their franchise on Nintendo, considering the mainline series Persona is a spinoff from is already a Nintendo exclusive series..... They already know the SMT audience is on Nintendo as much as, if not more than, Playstation. Technically, SMT is primarily Nintendo. It had it's run on Sega back in the day, but post-Sega, mainline SMT, Q spinoff, Devil Survivor, the ports of the Sega games, SMT#FE (quasi-Persona), are Nintendo. All they have on Playstation is the Persona spinoff series and the fighting game spinoffs of that, so if anything PS should be the one they're hesitant about. Technically there's no reason SMT mainline can't be on Sony and Persona can't be on Nintendo. I find it a little strange they polarized the series so much for seemingly no reason. @Darthroseman Fair point. I guess I like several characters despite not being into their games... just feels like an obscure choice. If they're all going to be like this one, the Pass could wind up being kind of boring. Capcom just did it - took the risk in a new system. One that tons of people said would fail. And the fan base came out to support it. A new Persona will sell well on PS4 regardless. Switch would simply be extra cash from reaching the people on Switch who do not have a PS4. Same dynamic publishers have with Xbox1 now. I've had Persona 5 on the PS4 from an ebay win.... but avoided playing it. It starts out amazing, but after research on the length to beat, I can tell it's a game I'll want to take my time on and play for half a year.... perfect for the SWITCH, not stuck in front of my TV. @Mogster Yes persona 5 characters are in PQ2 , so it not like it really negates what he said. All for P5 coming to switch though it would be the first mainline game to come on a ninty console i believe. Not taking this rumor to seriously though; just people on the Internet setting other peoples expectations up to high. @Equinox except both have been on Nintendo platforms even Cloud, though not via Final Fantasy VII at least not when he first appeared. Sounds to me like a case of fundamentally disliking the general tone of the game. Music, art, characters... They all play a part in setting the mood and Persona especially focusses a lot on that, so if you dislike that tone, you will probably hate the entire game. (I myself liked all of those things mentioned a lot in P4). In regard of that mood, all Persona games are very different from each other, so I can see how one can still love P5 and/or P3 dispite very much disliking P4. @NEStalgia Just a few quick corrections, SMT 3 was on PS2, as well as the Digital Devil Saga games. @NEStalgia #80 exactly, when people see exclusives they tend to think a deal is in place, but these two series work like this simply because Atlus decided so. And that’s why I hope P5 comes to the Switch, I’ve been wanting that for a long time even though I didn’t think it would really happen. Also, I always found it weird that Persona is tied to PS and SMT to Nintendo: since the former is more anime-like and the latter more gritty and grounded, you’d expect it to be the opposite. Looking forward to hearing something about SMTV, I just can’t wait for it! Though I’ll admit I’m a bit worried about the direction it might take, after playing IV Apocalypse: don’t get me wrong, I loved it and it trumps IV gameplay-wise, as the new additions are all super cool; ok the other hand, though, I found Apocalypse to be lacking everything that made my playthrough of IV incredibly memorable. I had never played an SMT before, and the first few hours just blew my mind in so many ways; and even after that, the atmosphere, the world and the characters were something else really. Apocalypse in my opinion didn’t deliver on that front, trading the gritty, oppressing atmosphere and tough moral choices of IV with an anime-like ensemble cast and the power of friendship. God how gutted I was. Haha, well, Apocalypse was kind of a SMTIV extended mini-sequel kind of thing, so it makes sense they'd experiment heavily with it. Similar to FF X-2 where it's a secondary side story tied to the FFX universe and characters but a very different tone. I'm not too worried about an actual numbered sequel. Apocalypse was play time for experimenting rather than expanding the lore. @Anri02 I forgot about those! For a long time the PS VITA was my Persona machine. Loved what I played of P5 unfortunately my PS3 was on it's last legs at the time. The persona games are perfect for handheld on the move P4 Golden is just perfect. P4G and P3 on Switch while we're at it please? I really hope Atlus is going to port Persona 5 to the Switch and PC but based on their history I have my doubts. For whatever reason they almost never port their games, even the big ones. Even if Atlus doesn't want to do it, Sega doesn't have the games ported by a different team that does ports. They're just leaving money on the table. Persona 5 isn't a taxing game even on the PS3. I got the Platinum trophy on PS4, but to be honest, I would play all again if it's an enhanced edition. P5 is one of my favorite games all time, and would be an outstanding addition to the Switch. If this rumor is true then this will be the first time a mainline Persona game will appeared outside the PlayStation platform. Rumors and Drama are the topics in this week! >Metroid Prime Trilogy in Switch announcement or Trailer of Metroid Primer 4 in Game Choice Award 2018 were rumors; many people excited by the rumors. >No announcement in the event; people do the usual drama, knowing that it was a RUMOR!!! >Nintendo announces the first character to know for the DLC of Smash Bros Ultimate, many happy people, but other people following their anger, RAGE for not seeing Metroid, knowing that it was a "RUMOR"!!! >Now, another ""RUMOR"", because this character from Persona 5 gives the possibility that that game could have a version for Nintendo Switch; many people again excited by this """RUMOR""". Ok, Internet, an any day! @readyletsgo PS3 version runs fine, just takes a few more seconds to load at times; the digital version anyway. @deKay The PQ2 version of Joker is chibified. The Joker shown in the reveal trailer was not. Again, a port that seems so obvious and one that would do well. Doesn’t mean it will happen of course because the video games business doesn’t always act logically but it makes sense. I'd double dip on this one. Got it on ps4 and only beat the first dungeon but really loved what I played. Such a stylish game. @Equinox MGS3D did end up being a Launch Title on the 3DS and we are getting FFVII on Switch next year. It’s not like these relationships don’t go anywhere. OMG I freaking love this game, I played it on ps4 and I hope to play it on switch. Knowing Atlus and the way they handle ecosystem exclusives, I doubt this is happening, but it would be VERY cool to have this on Switch in addition to SMT V.
In fact, it's one of the biggest reasons I own a PS4 in the first place. Not going to get my hopes up based on a character being in Smash as we should all know by now, that doesn't mean it's linked to new game announcements or partnerships. However, it's now kind of standard for Persona games to get a handheld version a few years later. That's a joker? looks nothing like one, looks more like the phantom of the opera. You also seem to forget we gotten Snake in the Wii Smash but never saw a Metal Gear game on the Wii not counting the 3DS remake of MGS3 or how cloud was in Smash Wii U but never got a port of final fantasy 7. I doubt it'll happen, but it's a welcome addition to the Switch lineup if true. Also, Smash is living up to the hype. I've never had this much fun with any game in the series. Really enjoyed these game but wish the social links were a side thing or at least open, all the up till end game. @NEStalgia you’re absolutely spot-on about the PS line’s “identity”, and that surely explains the association with Persona; it’s just weird to witness today though, seeing how Sony is moving more and more towards becoming a Western company. I'll take that trade off! Please please PLEASE let this rumor be true, I have zero problem double dipping. The best (in my opinion) JRPG in years. If it doesn't come to Switch, though, I really recommend you guys find a PS4 on sale for Persona 5 and Bloodborne. Tbh I believe they're the only two exclusives really worth it, but worth it they are because they're some of my favorite games of all time. @Pirlo_ze_sniper There are two characters in the series that are known as Snake. Now we need Reyn in Smash so he can get on 8 player mode and go up against a bunch of Jokers. Maybe the 5 DLC characters are a special deal Nintendo made with different company's. so in that sence, Persona comes to switch and joker will be playable in smashbros. 1 down four to go. I hope there will be more than five DLC tho 😜 season one next year season two after lol. @ClassSonicSatAm it's his thief code name. Some of the members of the Phantom Thieves take their names from playing cards. The main character is "Joker" because of his ability to use the wildcard technique, which allows him to use more than one Persona. Would be cool if this one came to Switch. I haven’t played a Persona game before, but some SMT on 3DS. But my brother is a big fan of the series and recommends it to me. I thought it was very odd that the first dlc character announced was from a PlayStation exclusive. while i would love Persona on the Switch, just give it a proper name dammit ....Persona 5 Reloaded?? are we still in the early 2000's? My literal beef with Cloud and Joker is their respective games have never been on a Nintendo console. At least with Snake, Sonic, Pac-Man and even Bayonetta (shudders) they've had their games featured on a Nintendo platform in some way or another. Honestly, Final Fantasy VII and Persona 5 should come to the Switch and I can stop being a ball of rage about this. i got persona 5 for ps3 when i picked up my ssbu preorder, so if it dose come to switch i'm not getting it. @Equinox Cloud, call it a gen delay lol. But FFVII is coming to Switch next year. Shame when he first showed up was on the heels of The Twin Snakes, the full blown MGS remake gamecube exclusive. So theres some precedent!